When a customer in the power generation industry required a quality-driven, custom fabricator for electrical enclosures, they looked no further than Spencer Fabrications. 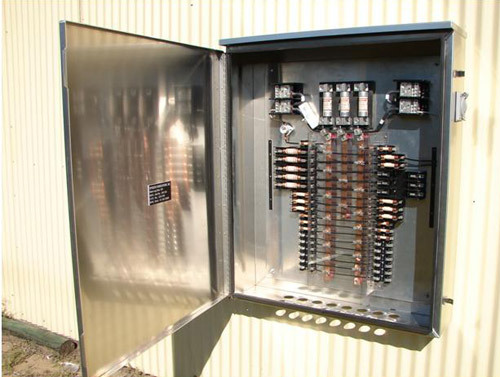 This NEMA 3R electrical enclosure was manufactured based on customer supplied specifications that included an unconventional size profile (40" long x 48" high x 9" wide), bringing our expertise in customization to the forefront. 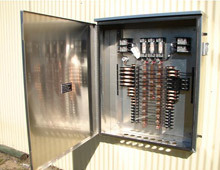 Although made from aluminum, we have the capability to fabricate these enclosures from steel and stainless steel, as well. We sourced all of the internal components, and performed the wiring, and assembled the unit as part of our overall product fabrication. This project meets NEMA requirements, while exceeding customer expectations. We were able to complete the project within 8 weeks and offered delivery to the customer's location. Quality, customer service, and customization are what we are all about. Contact Spencer Fabrications, Inc. or see below to learn more about how our expertise can work for you. Overall Part Dimensions Material Thickness: .125"